Time Warner Ready To Unload AOL In Pieces. But At What Price? Time Warner is moving forward with its plans to sell off AOL in pieces, and is finally ready to formally separate the AOL portal and advertising business from its legacy dial-up access business. But how much can it hope to get for these parts? When Google invested $1 billion in AOL a few years ago for a 5 percent stake, that valued AOL at $20 billion (which some people thought was an inflated figure even back then). Today, even after breaking it up, Time Warner will be lucky to get more than $7 billion for the whole lot. Although it wants $10 billion for just the advertising and content business, there are only two serious potential buyers: Yahoo and Microsoft. And Time Warner is not making any friends at Yahoo by interfering with the selection of one of its new board members. If Microsoft turns out to be the only bidder, it would have no reason to offer much more than the $4 billion that the market is valuing the business at today. And, of course, all bets are off if Microsoft ends up buying Yahoo instead. (The dial-up business also only has one serious buyer: Earthlink). The Yahoo discussions have valued AOL at around $10 billion, excluding the dial-up business. In contrast, Time Warner’s current stock price — around $14 — suggests a value of no more than $3 billion to $4 billion for the ad-sales and content businesses, some analysts say. If Time Warner can convince Yahoo it still needs AOL, it might get closer to that $10 billion valuation for the online ad and content business. (Except that transaction would likely be structured so that Time Warner gives Yahoo cash in return for a large minority stake in the new combined AOL-Yahoo). 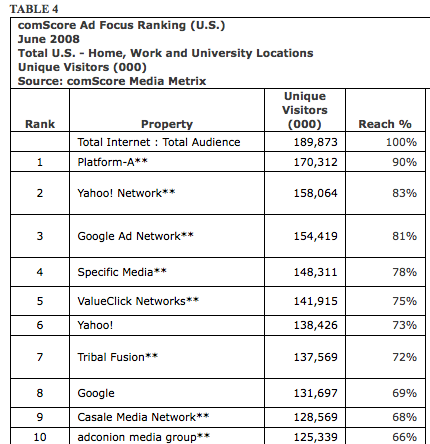 According to comScore, AOL’s Platform-A is the largest online advertising network in the U.S. in terms of its reach, with 170 million individuals seeing its ads in June. Although Yahoo is probably bigger if you add together the reach of its advertising network with that of its own sites, depending on how much overlap there is. And many of those Platform-A ads, especially those from Advertising.com, are remnant ads sold at less than $1 CPMs (so volume is key). (Disclosure: I own Time Warner shares). How Much Is All Of AOL Worth?